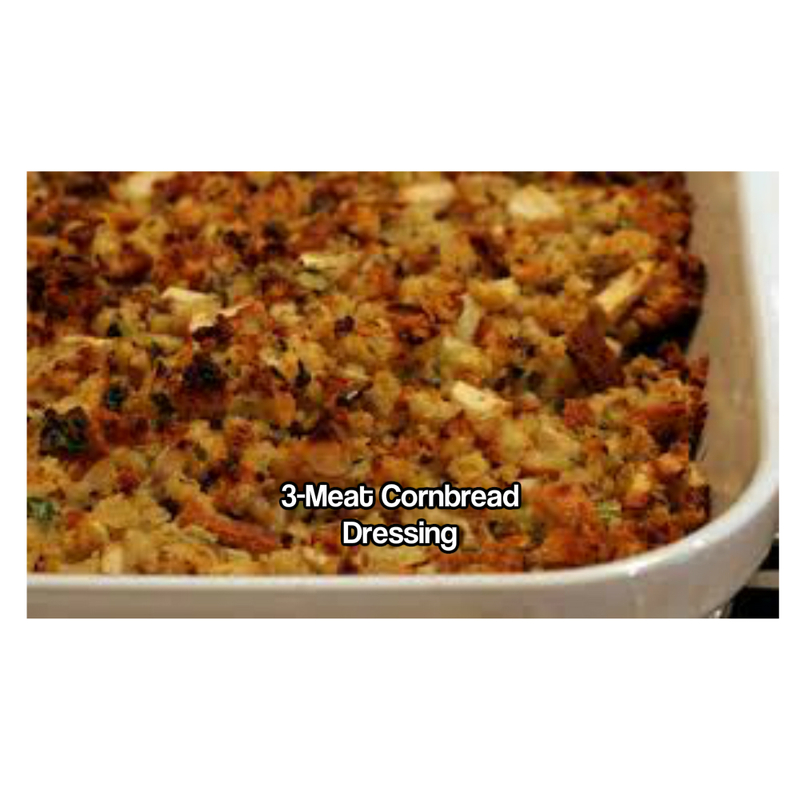 This 3-Meat Cajun Cornbread Dressing is more than just a dressing. It can become an entire meal in itself. Bake cornbread and set aside. You will need at least 8 cups. The more cornbread you add to this recipe, the less soupy it will become. If the mixture is too soupy, either add more cornbread or increase the oven baking time until you have obtained the desired texture. When the vegetables have cooked down a bit add all the meats, include the water from the boiled livers and the chicken broth; mix well. Simmer for 2 hours, stirring occasionally. Add a small amount of water at the time, if needed, to maintain a thick soupy consistency. Thirty minutes before the meat/vegetable mixture is cooked, add the minced garlic, green onions, Lipton Onion Soup mix and Worcestershire sauce. When that is done, add the cornbread to the meat/vegetables and mix well. Place all the mixed ingredients in a large baking pan (12" x 14"). Bake at 350 degrees F. for 30 minutes, or until the desired texture is reached. 16 servings. This can be a stand-alone food or a side-dish which greatly compliments any holiday main entries, i.e., baked or deep fried turkey, as safe turkey stuffing, pork roasts, beef roasts, baked ham, outdoor barbecues, etc.